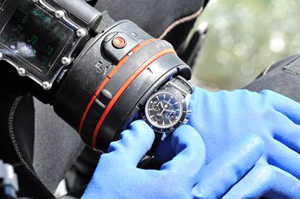 During diving, accurate and precise measurement of time is a vital necessity, and any error counting the minutes spent under water or any sudden interruption of the clock mechanism could have disastrous consequences. 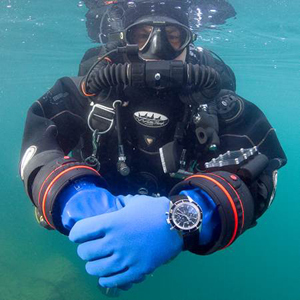 From looking in the first diver’s watch Jaeger-LeCoultre watchmakers have always tried to achieve absolute security. 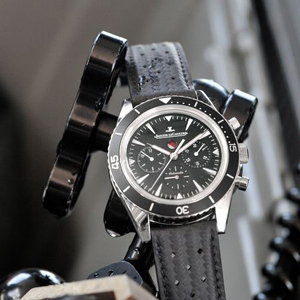 Jaeger-LeCoultre Deep Sea Chronograph is equipped with an indicator for the chronograph function that contributes to the safety of divers, allowing them to see at a glance that the stopwatch is measuring a certain time interval, which is ready to be activated, or that the measured time is displayed by the various counters. For this particular house engineers were inspired by a historical model, the Jaeger-LeCoultre Chronoflight, a chronograph on board invented in 1930 to equip the civil and military aviation. It was going to complete the range of onboard instruments made by Jaeger in 1910. The Chronoflight presented a series of totalizing counters in particular were used to calculate the total flight time, deducting the airports. Used for over 30 years, its strength and its precision made him among the drivers of racing cars of a favorite chronographs. Today, Jaeger-LeCoultre Chronograph Deep Sea was inspired by a mechanism in the Chronoflight making it available to divers. Positioned above the inscription on the dial Jaeger-LeCoultre, a round window shows the indicator function of the chronograph. The latter consists of two discs – one white and one red – that provide information about the status of the chronograph, without any risk of error. When the display is blank, the chronograph is ready to be activated to start the measurement of a time interval. Once the chronograph has been started, the window display simultaneously shows both colors – red and white – indicating that there is an ongoing measure. Finally, when the chronograph is stopped, the window is shown only to indicate that the red disk – before resetting the chronograph – the measurement performed can be found. 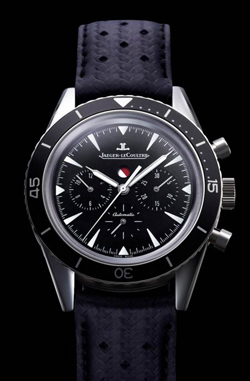 Jaeger-LeCoultre Chronograph Deep Sea is a tool designed for professionals and meets all the criteria imposed on diving watches from the standard ISO 6425. It features a unidirectional rotating bezel, is water resistant to 10 bar (100 meters), readable in the dark, and also protected against magnetic fields and shocks. The indicator function takes the SUB small seconds at 6 o’clock. This model is driven by the new movement Mechanical automatic Jaeger-LeCoultre Calibre 758 features a balance that oscillates at 28,800 vibrations per hour and has a power reserve of 65 hours. The chronograph includes two counters (one hour, one for minutes) and a central second hand. The clock face is distinguished by the clarity of the information provided by hands and hour markers. Two buttons positioned at 2 and 4 are used to start, stop and reset. The case of 42 mm diameter steel and assures him wearing a black leather strap. For this particular house engineers were inspired by a historical model, the Jaeger-LeCoultre Chronoflight, a chronograph on board invented in 1930 to equip the civil and military aviation. It was going to complete the range of onboard instruments made by Jaeger in 1910. The Chronoflight presented a series of totalizing counters in particular were used to calculate the total flight time, deducting the airports. Used for over 30 years, its strength and its precision made him among the drivers of racing cars of a favorite chronographs. Today, Jaeger-LeCoultre Chronograph Deep Sea was inspired by a mechanism in the Chronoflight making it available to divers. Positioned above the inscription on the dial Jaeger-LeCoultre, a round window shows the indicator function of the chronograph. The latter consists of two discs – one white and one red – that provide information about the status of the chronograph, without any risk of error. When the display is blank, the chronograph is ready to be activated to start the measurement of a time interval. Once the chronograph has been started, the window display simultaneously shows both colors – red and white – indicating that there is an ongoing measure. Finally, when the chronograph is stopped, the window is shown only to indicate that the red disk – before resetting the chronograph – the measurement performed can be found. Jaeger-LeCoultre Chronograph Deep Sea is a tool designed for professionals and meets all the criteria imposed on diving watches from the standard ISO 6425. It features a unidirectional rotating bezel, is water resistant to 10 bar (100 meters), readable in the dark, and also protected against magnetic fields and shocks. The indicator function takes the SUB small seconds at 6 o’clock. This model is driven by the new movement Mechanical automatic Jaeger-LeCoultre Calibre 758 features a balance that oscillates at 28,800 vibrations per hour and has a power reserve of 65 hours. The chronograph includes two counters (one hour, one for minutes) and a central second hand. The clock face is distinguished by the clarity of the information provided by hands and hour markers. Two buttons positioned at 2 and 4 are used to start, stop and reset. The case of 42 mm diameter steel and assures him wearing a black leather strap.